I read with no little surprise and disgust an editorial in the Evening News of February 14, headed, "Give us Some Miracles," said article being called forth on account of the appearance in Detroit of Swami Vive Kananda, the Brahmin monk, who edified and delighted, not only the clergy of all denominations, but all who heard him in the parliament of religions at Chicago. His candor, simplicity and marvelous mentality are only exceeded by his earnest efforts towards the unity of religion and the brotherhood of man. The editorial in substance calls upon Vive Kananda, whom it styles "one of those wonderful East Indian mahatmas, to shut up or put up," and challenges him to show some of the "mystifying tricks" alleged to have been witnessed by travelers in India, special attention being called to the articles written by Dr. Hensholdt, now being published in the Arena. The editorial sneeringly and sarcastically alludes to these "doings of the adepts of India" as professedly "being on a par with the miracles of Jesus of Nazareth," yet carries the inference that they are but "tricks of fakirs: ' The article concludes by avowing that "Kananda will talk, but do nothing but talk," and because he does not produce any of the so-called miracles "he will injure his boasted religion of superiority more than he will help it." The writer of that editorial ought to know that none more stoutly declare that there are no miracles, never was such a thing as a miracle, that nothing is supernatural, more than the "wise men of the east," or the intelligent recorder or traveler, familiar with the Orient. What the East Indians do claim, and what theosophists and all profound thinkers claim, is that the learned of that country have a better and purer knowledge of the hidden forces of nature, of spirituality, of practical humanity, of religious mysteries, and the occult generally, than has been revealed to many in the western world. They have a better knowledge of the Arians, earth's earlier ages, and of pure Sanscrit literature, including the lost arts and sciences of modern times, and also of the fundamental basis of all religions. The wise of India are no more responsible for the superstitions, the pretensions, or for those who err and sin, than the good of our own land are responsible for the mistakes and wickedness of the present day. Why call an honest exponent of a pure and simple religion of charity and humanity, to account for the errors of some of his fellows of that vast and varied country, whose total population some self styled Christians delight in dubbing "heathen"? Shall we send our sectarian missionaries to his land, and kick him out of ours because forsooth! He can't hoodoo us with some hocus-pocus tricks or show us what never existed-a miracle? Christ when in the flesh, was thus importuned by the ignorant rabble, who disbelieved his holy name, and charged him with being an imposter, and who was finally spat upon and put to death by the same bigoted, intolerant mob, who only cried: "Crucify him!" When they jeered him to scorn, and cried, "Show us a miracle," he calmly and meekly rebuked them, saying, "Ye would not believe Moses and the prophets, neither would ye believe though one arose from the dead: ' It is only the ignorant who expect or seek for the miraculous. The adepts of India or of any other land do not pretend to do marvels; they only by a superior spirituality gained by long fasting, long study, long crucifying of the lusts of the flesh, long meditation upon "nature's finer forces," are enabled to do what would fill the minds of the superstitious with awe and wonder. All scientists familiar with that wonderful country declare the natives experts or adepts in hypnotic power, and for unknown ages they have held the key to electricity, and many other of nature's marvels. India was very old before our nation was born, and her savants have forgotten more than we with our boasted civilization know. 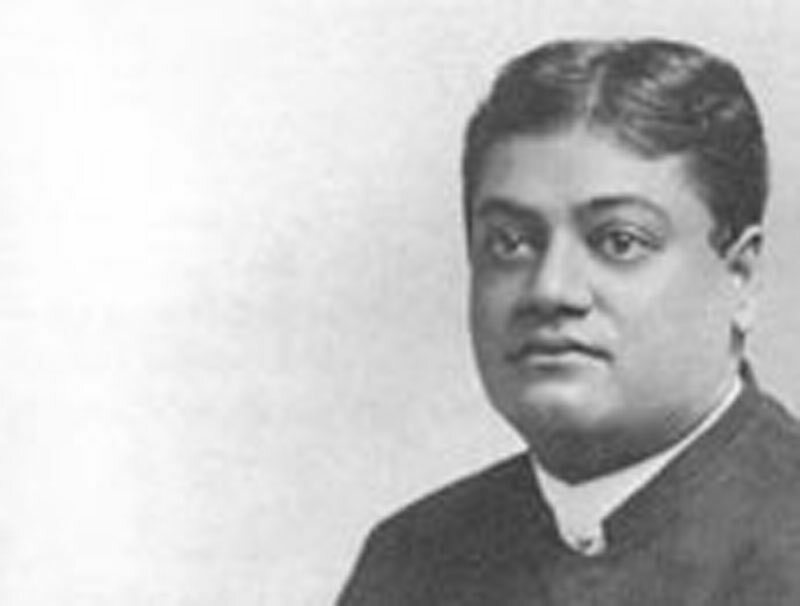 If Swami Vive Kananda succeeds in expounding a gospel of peace, of purity, of self sacrifice and brotherly love; if he succeeds in opening the blind eyes of bigotry, and in unstopping the deaf ears of the intolerant, and shows the professed Christian that even a heathen has some virtues which Christians lack, and more than all if he softens the strong heart of humanity, which he already seems qualified to do, his mission among us will not be in vain.